The Rock the World Network is a community of uncommon givers. The Uncommon Giving show features the leaders of charities, foundations and corporations rocking our world. Chicke Fitzgerald interviews Susan Schaefer and Linda Lysakowski. The original live interview was on 6/7/2013. This episode is #53 of all time in the top 100 shows on Solutionz Live! Susan Schaefer, CFRE, is a consultant, writer, and speakers who has empowered dozens of organizations to exceed their financial goals. In her twenty years as a philanthropic consultant, Linda has managed capital campaigns, helped hundreds of nonprofit organizations achieve their development goals, and trained more than 25,000 development professionals in Canada, Mexico, Egypt, Bermuda, and most of the 50 United States. What if you could sit down with 25 successful consultants and ask them what makes their businesses tick? 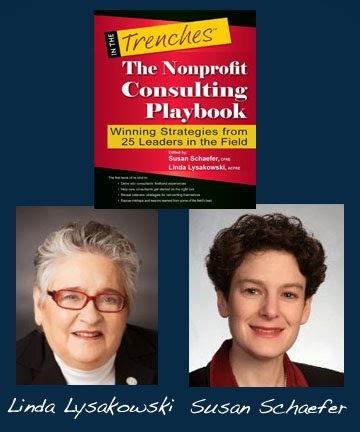 In The Nonprofit Consulting Playbook: Winning Strategies from 25 Leaders in the Field, Susan Schaefer and Linda Lysakowski have compiled a first-of-its-kind insight into the everyday lives of consultants to the nonprofit sector. This collection of firsthand articles takes the reader on a journey that spans a consultant’s professional life—from the decisions that formed the business to a detailed set of options for winding it down. The beauty of this book lies in the honesty of its 25 contributors. They write openly about the decisions that guided their business models, their early mistakes, and their lessons learned. Susan has helped lead the design and implementation of the billion-dollar Gates Millennium Scholars Program, one of the largest private grants in history. This fall, she will teach fundraising at Johns Hopkins University.